We are praised in the market to be one of the leading providers of this H.B.M. Chain Pulley Block. In order to live up to this reputation, we have done a great effort to keep it economical without compromising with quality. 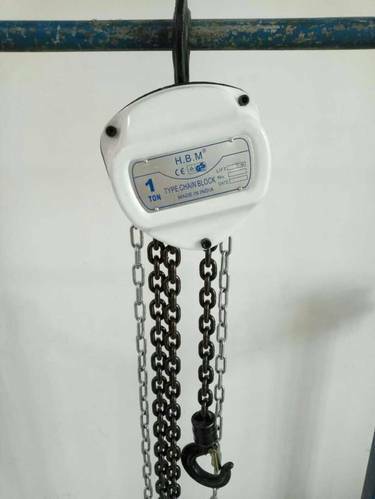 Used for lifting various heavy objects in several factories and warehouses, the pulley has an immense load bearing capacity. Established in 1981, Bharat Mechanical Hoists & Company supplies high quality lifting and rigging and height safety solutions to clients in the construction, utilities, oil and gas, mining, agriculture and manufacturing industries. We are the prominent supplier and trader of our products. These clients range from multi-national companies including Ford, Orica, Boral and Downer EDI, to government-based clients and primary producers. Bharat Mechanical Hoists & Company provides a complete range of testing services to ensure your equipment is safe and sound. This includes our inhouse testing facility and our mobile workshops, which are fully equipped with all the essential technology. We can also help you manage your lifting assets with our web-based solution, our Asset Register Management System (ARMS).